Hurrah! I’ve finally finished knitting Brigitte with Mohair Haze! But I must stress that it’s not the pattern’s fault that it took so long; just life getting in the way, as it does for all of us now and again! In fact the pattern is quite easy to memorize; you just have to pay attention to the first row of the 20 row pattern repeat and then you’re off! The yarn is lovely to work with and actually quite easy to frog if you make a mistake. I thought it would be a bit like Kidsilk Haze where you can get in a real tangle when the fluffy fibres knot together. Of course, you still need to be relatively careful when you come to the end of each row; this is where the fibres are more likely to knot together if you’re ripping back row after row. I think it is less likely to knot as Mohair Haze is actually a very soft and silky yarn; making a knot in the yarn when sewing the pieces together was often difficult as it would easily slip undone. Not only is Mohair Haze a soft and silky yarn it also feels soft and silky next to the skin; it does not feel scratchy or itchy at all. In reality, it feels very similar to Angora Haze, the yarn Mohair Haze was made to replace. It does shed fibres too but not nearly as much as angora yarns, which I absolutely dislike! I am hoping this will get a little less after it’s first wash. I knitted an extra 40 rows approximately in the length of the body as I have a long torso. I always dread this because I have to work out new buttonhole placements but, due to the construction of this design, you have to do this anyway. By this I mean that the button band is knitted in rib separately and then slipped stitch on afterwards, stretching the button band very slightly as you do so. Then you sew on the buttons and knit the button hole band making the buttonholes to match the position of the buttons. This actually was the trickiest part of the pattern as knowing how much to stretch the bands as I sewed them on to the garment took me a couple of times to perfect. 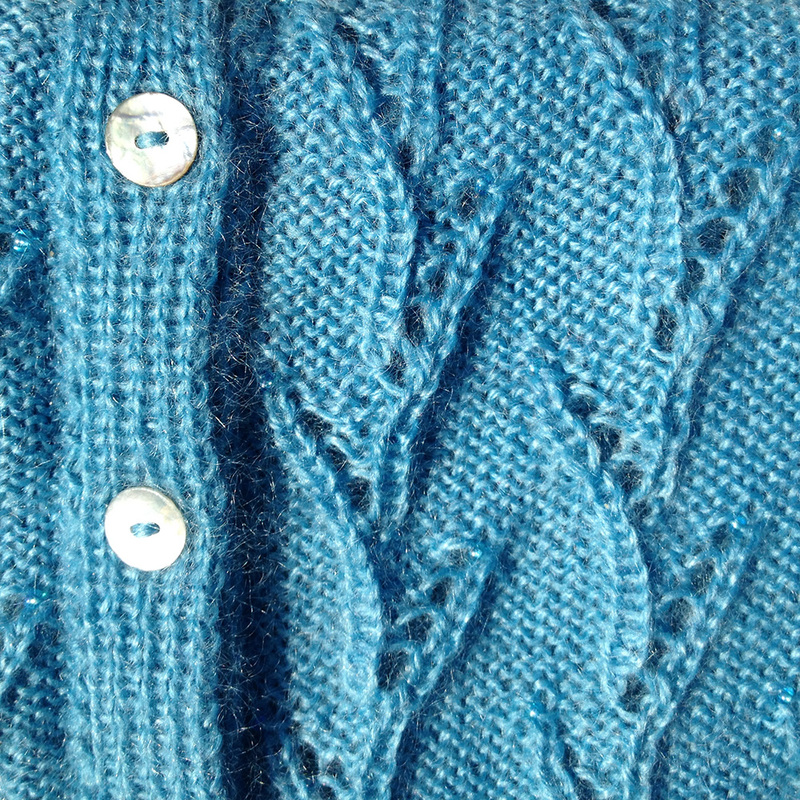 Anyway, I got there in the end and was happy with my 7 little blue-tinged shell buttons. Here’s a close-up of the buttonhole band and you can just about see the little blue transparent glass beads. Now that I have knitted with Mohair Haze and I like how it feels…..not too warm but just right……I am going to save up my pennies and knit the design Karolin by Lisa Richardson pictured below. However, I may not get around to it until next winter as my knitting project list is at least 6 garments long at the moment. The pattern for Karolin can be found in Rowan Knitting & Crochet Magazine Number 56 and also in the magazine Knitting, front cover picture below. 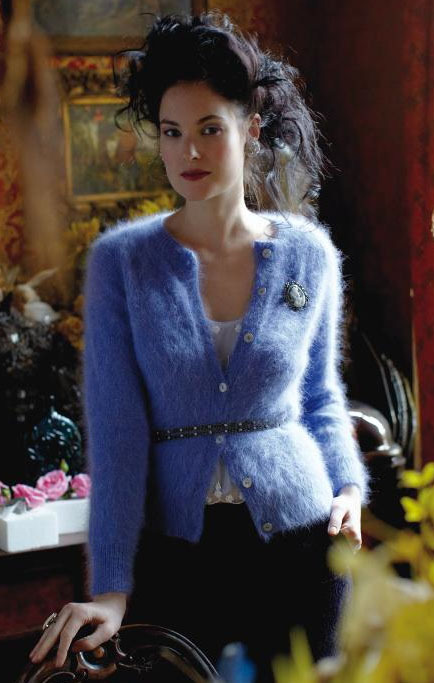 However, if you want to knit something a little simpler using Mohair Haze how about Stanza by Sarah Hatton…………. Or Rita, pictured below, designed by Martin Storey and featured in the Angora Haze brochure. 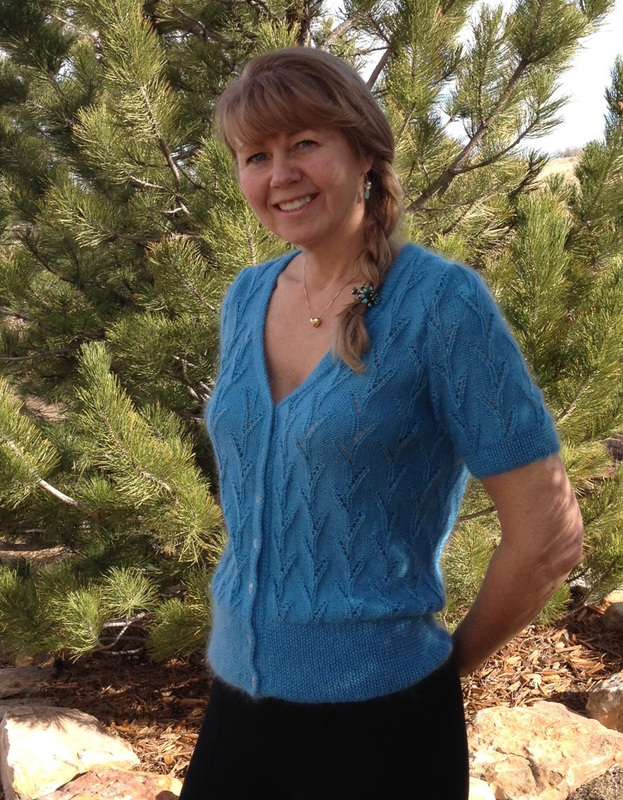 All the patterns featured in the Angora Haze brochure can be knitted in Mohair Haze, just like I did with my short-sleeved cardigan Brigitte. You just need more yarn: for every 1 ball of Angora Haze you will need approximately 1.5 balls of Mohair Haze. Have you knitted with Mohair Haze yet? I’d love to know if you have or if you are going to and what do you think? Please share with me and my readers by leaving a comment at the bottom of this post. I have written two previous posts about knitting with Mohair Haze and how I chose and threaded the beads onto the yarn; click on the links below if you would like to read these posts. 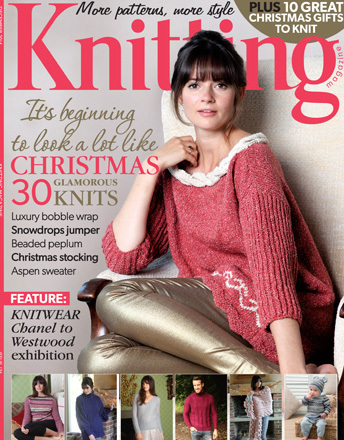 Also, find a link below to Knitting magazine, Issue 136 Dec-14 which features Lisa Richardson’s Karolin design……….